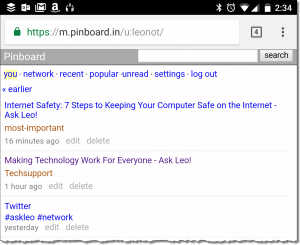 Pinboard - Never Lose Bookmarks Again - Ask Leo! You may notice I rarely talk about browser-based bookmarks (also called “favorites”). That because I rarely use them. Instead, I use Pinboard, an online service that saves my bookmarks for me. Let’s review the problems with browser-based bookmarks, and why a service like Pinboard is such a powerful alternative. Using your browser to keep track of your bookmarks has several major problems. If you use multiple browsers (as I do), you must manage separate sets of bookmarks. If you use multiple machines (as I do), you must manage separate sets of bookmarks. If you get a new machine, you must re-create your bookmarks. If you have multiple devices, such as a mobile device as well as a PC, you must manage separate sets of bookmarks. Now, it is true that in some browsers you can “sign in” and have the browser’s parent service maintain bookmarks across multiple different instances of that same browser. For example, I use Chrome as my default browser, and I also let it log in to my Google account. Any bookmarks I create in one copy of Chrome are automatically replicated in my logged-in Chrome sessions on other machines.1 But that doesn’t help if I want a set of bookmarks that work across Internet Explorer, Chrome, Firefox, and other browsers. Pinboard is a successor to the widely-popular del.icio.us.2 Once owned by Yahoo!, del.icio.us pioneered the service-based so-called “social” bookmarking service. It’s very simple: instead of saving your bookmarks in your local browser, you save them to an online service. Adding a bookmark is as simple as (ironically) clicking on a “bookmarklet” in your browser. That service then builds a web page just for your account, listing all your Pinboard-saved bookmarks. To use your bookmarks, just return to your Pinboard bookmark page and click on the appropriate link. Since it’s an online service, all your bookmarks are accessible from any browser on any device. You can even choose to make some (or all) of your bookmarks public; hence the “social” aspect of bookmarking. After you’ve signed up for Pinboard, visit their “how to” page at https://pinboard.in/howto/. In the section labelled “Saving Bookmarks” are several bookmarklets you can add to your browser’s bookmarks bar. Click and hold on the “popup” bookmarklet, and drag and drop it to your bookmarks bar. Since the default name of the bookmarklet is likely to be “popup”, you might want to edit the name to be something more meaningful. I’ve renamed mine “Save in Pinboard” in the example above. Once you’ve added the bookmarklet, you’re ready to start Pinboarding. Let’s say you’re visiting your favorite tech support web site, and you want to save a bookmark to that site, as you expect to return to it often. Click the “Save in Pinboard” bookmarklet. Click the “add bookmark” button in the resulting dialog. If you want, you can add or update information before you click “Save bookmark”. Most valuable might be to add tags to your bookmark. If you have a lot of bookmarks4, tags are a great way to keep things somewhat sane and organized. My Pinboard page, viewed on my mobile phone. Viewing your saved bookmarks is as easy as visiting your Pinboard page on any browser, computer, or device you use. Your bookmarks are there, ready for you to refer to and use. My Pinboard page, for example, is at https://pinboard.in/u:leonot. Your URL will be based on your username. If you click my link, you’ll see that my pins (the shorthand term for “bookmarks saved in Pinboard”) are public by default. You can choose to keep yours private if you like. If I’m logged in to Pinboard, I’ll see additional options, like editing and deleting the bookmarks I’ve created. In addition to my pins, you’ll also see a tag cloud. Those are some of the various and sundry tags I’ve used to attempt to organize my pins. Click on any tag, and you’ll see only those pins I’ve marked with that tag. You can also share links to collections of posts you’ve tagged, such as this link, https://pinboard.in/u:leonot/t:most-important/, which contains a list of the articles on Ask Leo! I consider to be the most important. Pinboard is incredibly powerful, and I’ve only touched on its most basic features — which, to be honest, may be enough for most users. It’s a quick way to keep your bookmarks in one place you can access from anywhere. Importing bookmarks from your browser. Importing bookmarks from your Twitter feed (you can see I currently have this enabled). Privacy by default (as I mentioned above, I have this off). Export (for your own backup, at least! :-)). Connection to advanced services like IFTTT and Zapier. Spend some time on the “How To” page (https://pinboard.in/howto/) if any of this sounds intriguing. But most of all, consider using Pinboard so you never lose your bookmarks again. 1: It also replicates extensions installed and settings changed. That’s not always what you want, but as I understand it, it’s an all-or-nothing deal. 2: Which Pinboard purchased in June, 2017. 3: To the best of my knowledge, they don’t have an affiliate program, so I get nothing if you sign up. I’m just a happy user of the server wanting to share it. 4: I have 3000+ at this point. « Previous post: I’ve Been Told My Computer Has a Virus, But My Anti-Malware Program Doesn’t Remove It. What Do I Do? XMarks works fine for me on Chrome. XMarks is pretty good, but in a way it’s something slightly different. As you say, it “syncs” bookmarks. Pinboard is a completely separate service. Xmarks does “sync” your bookmarks, but it also stores them “in the cloud” – they can be accessed and edited locally or online any time, and it keeps your bookmark history backed up for 6 months. Optionally, you can also sync your search histories across machines/browsers. It is currently owned by LastPass (personally, I use KeePass, but from what I understand, LastPass is also great) – if you do use LastPass, you can bundle it with the xmarks premium service. I am curious as to what exactly Pinboard offers that xmarks does not? I tend to be a Google (power) user. If you log into Chrome, (go to settings to log in) then bookmarks sync across all Chrome installations on any platform. If you get a new computer, after installing Chrome and logging in, the bookmarks are automatically restored. But only within Chrome, not other browsers. (and, I don’t believe, the chrome mobile app). There was a similar website years ago called “Backflip.” It was great! Unfortunately, they fell on hard financial times. They took the site down for maintenance and it never came back up again. I currently use the bookmark saving feature of Yahoo’s My Yahoo! web pages, but I’m also concerned about its long-term viability. I’ll give Pinboard a try. Does pinboard work with iPhone/iPads? I use the ‘clip to Evernote’ function. That’s great if you are an Evernote junkie like I am!! I don’t use a lot of the features but the ones I do use I love ’em. I’m one of these guys that works regularly on 4 different computers!